There is a growing concern, as fossil fuels are recovered from the ground, that the cost of the energy required to extract and process them is rising, and that a point may be reached where it is no longer energy-cost effective to continue with production. In this post, I'm going to discuss the use of explosives, one of the ways that helps keeps the energy cost of surface mining down but by showing two different ways in which they are applied, try to illustrate the difficulty in coming up with an energy cost. Mining tends to use significantly more explosive than other industries (and that includes the military). I was reminded of this when, in the course of demilitarizing unused ammunition, we looked for civilian uses for the explosive that we had removed. To begin with, the explosives tend to be of different types, so the best of one is not necessarily that much use in the other, but more to the point the quantities that would be generated were trivial, relative to those of industrial need. Why do we use the explosive in the first place? Well coal seams are generally found under a certain amount of rock and soil, the overburden, and while the soil can be relatively easily removed by scrapers, and similar equipment, the rock must be broken into easily handleable pieces before it can be moved. The soil is removed and stored, so that, after the coal is gone, the land can be restored – there are, in most countries now, strong regulations regarding reclamation, and a significant effort is made to achieve land recovery after mining. 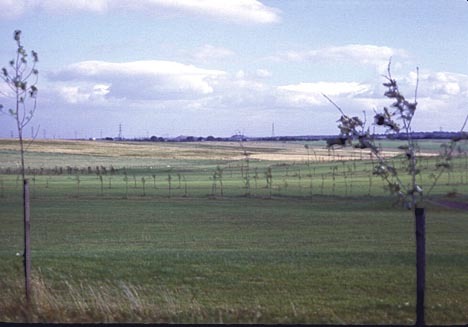 Acorn Bank open cast site, just after reclamation. I have put this picture up in part, because it is rare for those who debate the issues of mining to show what the mine looks like after reclamation. To achieve this level of restoration, however, the site must be catalogued before mining, and the soil and overburden segregated so that it can be restored, and the conditions re-established, after the mine has passed. 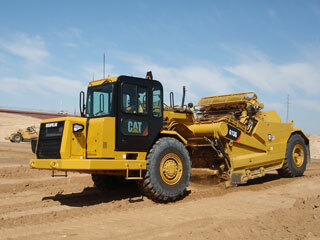 Scraper that could be used to remove and replace soil (Source Caterpillar). After the soil has been removed, then there are usually several tens of feet of rock that will lie over the coal. Before the coal can be mined this rock must be broken first, before it can be moved. The fracturing is usually done by drilling large (say 8-inch) diameter holes down through the rock, and then filling them about two-thirds full of an explosive. As a general rule you don't want to fill them all the way, since if you did, then when the explosive went off it would just shoot back out of the hole. The large columns of black smoke you see shooting from such blasts in movies are for effect. A skilled blaster will fire the entire round, and if you were to watch a slow-motion movie, the ground level would rise in a pattern, as the individual rows of charges went off, but there would be almost no gas vented from the holes. To confine the charge, the top part of each hole is filled with what is known as stemming, usually some of the rock particles that were removed from the hole during the drilling operation. Generally this fills the top third of the hole, after the explosive has been placed in the hole. The explosive that is used is no longer gunpowder – though to get back to the EROI question that I started the post with – how do you count the amount of energy used by the explosive? Is it that required to make the powder – gathering the ingredients for gunpowder (as a number of novels will be glad to inform you) is not that energy intensive, and while milling the particles to achieve a better burn requires some effort, it is nowhere near the amount of energy released when the gunpowder is set off. Modern blasting typically uses a mixture of ammonium nitrate and fuel oil, known as ANFO. (There are a number of videos on Youtube showing ANFO charges going off, you might start here ). A single blasting operation might use between 2 million and 5 million lbs of explosive, in conventional blasting the rock over the coal. (One of the largest disasters in Texas occurred when a ship loaded with ammonium nitrate blew up in 1947). In the simplified sketch below, the rock over the coal is first drilled and broken using the explosive charges, and then it is moved from over the coal to the spoil bank on the other side of the active mining section, so that the underlying coal can be taken out and away. The typical picture of large, uncontrolled blasts that make the popular press are actually quite far from the truth as to what usually happens in this stage. And the fireball from firing a shot in coal is very unusual. (It could come from igniting any gas in the coal, or from burning some of the very fine coal particles that are formed in firing the shot). Where the ground just heaves a little and then settles back is the sign of a good shot, since all the energy has gone into breaking the rock, so that it is then easier to move. The explosive is fired in rows, and this is to make the explosive work more efficiently. When you "fire" an explosive you are causing the chemicals in the charge to very rapidly turn to gas. At the same time the blast wave from the start of the reaction will have cracked the rock immediately around the drilled hole. Thus as the explosive turns to gas, that gas can penetrate into the cracks around the hole, causing them to grow out into the solid. The gas follows the cracks, and helps them to grow, while, at the same time "lifting" the rock away from the solid as the gas penetrates. At the same time, firing the explosive in a sequence lowers the overall vibration directed into the ground. However there is a fair amount of wasted energy in just lifting the rock with the explosive gases, and then allowing it to fall back into place. Thus there is a growing practice to use that energy more effectively by having it not only break the rock, but also to “cast” it into the open space beside it, where it would otherwise be loaded by machine. The need is, therefore to use the explosive energy more efficiently, and I rather suspect that since, until recently this hasn’t been much of a concern, there is still considerable progress to be made in improving the efficiency of the process. For example, by switching to an emulsion explosive the hole is filled more completely than with the granules of ANFO. But once the rock is broken and displaced it is still very simple to use shovels (albeit the rock is often moved with a dragline, and the coal then removed with the more precise control of an electric shovel). The thinking on this subject seems to derive from The Plantation Economy concept of "cost" applied to a green house gas generating endeavor. In that sense "the EROI question" gets down to the most efficient way to destroy ourselves the fastest. This post by Heading Out is to explain the energy cost of mining coal, not to debate the effects of coal use on the global climate. But if you are of the opinion that no coal should be mined due to its contribution to atmospheric CO2, then be prepared to go without electricity for 12 hours every day from now on (50% of electrical power is from coal in the US). Can you and the rest of the country do that? The 'alternative' sources of energy don't just all switch on and off each day, you know. Nuclear, for one, runs 24/7, and Natural Gas plants, while expensive, are perfectly capable of running around the clock. Even if we did have to go without electricity 12 hours a day, maybe that would spur investment into Solar Thermal, Solar PV, upgrades for Hydro, Ammonia Synthesis (from water+electricity), wave power, use ice-storage fridges and freezers (and use chest instead of uprights), etc. Try running a coal fired power station 12 hrs on and 12 hrs off. Not gonna work. Better to run it at a constant level 24 hrs/day and reduce the load. Wanna go first? "This post by Heading Out" discusses the efficiency or lack thereof in coal extraction techniques. I interjected the better frame of the issue to take it out of the realm of the false frame which you have now re-asserted, dirty fuel vs. fear and pain, meaning either we use coal or we suffer (a false frame). We have clean fuel now that can replace dirty coal as the fuel for diesel engines that power generators which generate electricity. The bottom line is that the most efficient way to do it wrong is irrelevant and eminates from the lizard brain (amygdala). Time for us to do some memetic evolution. When were you demilitarizing unused ammunition? Does the military look to civilian sources for surplus charges - are there still developments afoot in the field of petards and the like, too, which carry over to civilian applications? Also, why do they persist in utilizing explosives in seismic surveying? Maybe that's already been the subject of a Tech Talk. This is a nifty series - would greatly enjoy something similar about, say, the automotive industry. Fields which also have a bearing on the ramifications of peak oil, in other words. Perhaps the like is already out there - a Tech Talk dedicated to providing links to these would be useful, too. We worked on demil for about 25 years, starting in 1982. My point at the beginning however was an attempt to show that, in general, the two types of explosives used for civilian and military purposes are quite different - we charged a hole with neat military stuff one time in a tunnel face blast - ver-r-r-ry interresting!! Explosives generate short sharp pulses that can be useful in some aspects of seismic surveying, and in relative cost can be cheaper than some of the alternatives in some locations - but there are a lot of other sources of energy for seismic also out there. And thanks for the kind words, but we mainly want to focus more on getting the fuel out of the ground here, and this series was to give more of a background to help folk understand some of the terms that often pop up in articles about the technology. (Plus I am not that familiar with much of the automotive side of the house). By verry interesting, I presume you mean more of a blast than you expected, or bigger fireball, etc? A friend of mine is a mining engineer at an Australian open cut coal mine (strip mine format) - ask him, or anyone else there, their favourite part of the job and the answer, is without hesitation, when they do a blast. They only do a few of them each year, but it's always a big occasion - all the mine staff not involved get the afternoon off, they bring out their wives and kids to watch the blast, BBQ lunch etc etc. As you point out, blasting has become quite a developed art, but there are times when things do not go as planned. Preparing for one blast, the drillers had drilled into an underground cavity, in one of the holes near the face. This was recorded on their drill log, but when it came to charging the holes with anfo, the blasting guy somehow missed it. So the story goes, the anfo truck driver (they deliver the stuff in a concrete mixer truck and just back up, set the chute, and reverse the rotation) was telling a particularly good joke while they filled this one of over hundred holes, and just kept the discharge going until the level in the hole reached their "float switch" at 1/3 depth. They didn't notice at the time, that they had put 3x the normal amount into said hole. When the blast went off, the first part went as it should, just like the linked video, but then, when it go to this hole, the side blew out completely, with the fireball making it to atmosphere! Rocks were thrown several hundred yards, mine vehicles were covered with dust, and the company CEO (mine was/is part of a big coal mining company) who had come out especially to see the blast got quite a show! Needless to say the blasting supervisor was relieved of his duties - explosives are no joking matter! When you say a blasting operation uses 2 to 5 million lbs of explosives, what is a) a single blasting operation? Is it just for one set of blasts or does it refer to some kind of contract to cover a whole sector of the opencast mine. And b) Does that include the ammonia nitrate and fuel oil or just the ammonia nitrate? Getting back to EROI, presumably the NH3-NO2 is chemically produced by some industrial plant. What sort of energy is required for this? And 2-5 million lbs sounds like quite a lot actually. I have heard that producing ammonia is quite energy intensive and as is the case also for nitrates? Has anyone done calculations relating this? For example lets suppose one of these explosions of 2 million lbs of NH3-NO2 uncovers 2 million tonnes of typical coal. Then I guess we can get a rough indication of the EROI. Perhaps those with experience in this field, would be able to plug in reasonable numbers for the above. NH3 is ammonia, a compound. Ammonium Nitrate is a salt, so needs a cation and anion. Ammonium and nitrate ion respectively. Yes, there's a lot of embodied energy in ammonia and nitric acid. Ammonia is made from the nitrogen out of air and hydrogen, most typically from natural gas, via the Haber process. Nitric acid is typically made from by oxidizing ammonia to nitric oxide, thence further oxidized to nitrogen dioxide, thence absorbed in water to make nitric acid. Ammonia dissolved in water forms ammonium hydroxide aka "ammonia water", a common household cleanser. The nitric acid and ammonium hydroxide (base) are mixed, and react, forming a salt and water. The water is carefully evaporated to leave the ammonium nitrate salt as a solid, to be used in explosives, fertilizer, etc. about 150 million tons of ammonia per year worldwide, 80 percent to fertilizer. (low of) 27.8 MBtus/tonne is 8147 kilowatt-hours/tonne - I think that's ammonia and hot just hydrogen. They put is at 21,730 kW-hrs/tonne. 20 MW-hrs/tonne * 150 Mtonnes = 3000 TW-hrs/year (worldwide, rough calc) to make ammonia. At a world average energy consumption rate of 15 TW, that is 3000 TW-hrs/15 TW = 200 hours out of 8766 hrs/year = .023 of world energy use. (1/40th). Not the biggest energy use, but non-negligible for ammonia. Note sure what fraction of the 20% of ammonia NOT used for fertilizer (30 Million tonnes/year) goes to explosives. Bituminous coal, solid is 1.3 tonnes/m^3, so 2 million tonnes of coal would be 1.5 million m^3. A 10 m (30 foot) thick seam would cover an area of 390 m x 390 m (1200 ft x 1200 ft). 2 million pounds (1000 tonnes) would get divided up with a tonne each 12 m x 12 m (40 ft x 40 ft) grid - possible I suppose. using 20 MW-hrs/tonne of ammonia, x 1.5 for additional processing (nitric acid, etc), makes for 30,000 MW-hrs for the 1000 tonnes of explosive. The energy density of coal (after conversion to electricity) is roughly 2 kW-hr/kg, or 2 MW-hr/tonne. 2 million tonnes of coal is thus 4 TW-hr, or 4,000 GW-hr. Explosives roughly 30 GW-hr, so EROEI is 133. But that's only the explosives, have to drill holes, scrap off broken rock, move it, pile it up, dig and haul coal, ... .
EROEI of coal varies, I'd say for the sake of argument these days I'd believe around 30 at mine-mouth, 10 after conversion to electricity. So explosives would be a small part of the energy cost - until natural gas skyrockets. The volume would be used in one blasting operation. Basically the intent is to fracture enough of the rock ahead of the mining shovels that they can then work steadily and without interruption. The ammonium nitrate and fuel oil are mixed together before being poured into the blast-hole, and the number is the combined weight of what has then become an explosive. And I'll let the comment below this (and for which much thanks) answer the rest of the questions. and the number is the combined weight of what has then become an explosive. Even before adding the fuel oil ammonium nitrate is an explosive. I think thats what blew up in the IIRC Texas City ship explosion in 47. Of course with extra oxidant ammonium nitrate can be made more powerful by adding something to combine with the extra oxygen. I presume fuel oil is cheap and easy to mix, but I imagine other stuff could be used as well. while a student I was on a field trip in Scotland. We were travelling along a coastal road.Picture the sea on the left and a couple of meters lower than the road, rock face on the right. We were stopped by a worker at some road works on a right hand bend that were widening the road. There was only one way for them to widen and that was into the rock. The workers cleared the site but we were still held up and wondered why. The rock face suddenly leapt across the road and into the sea. Clearing up with a JCB? Nah, one man with a sweeping brush. After that I have some respect for shot firers. Shaker trucks (land) and compressed air (sea) are fine for seismic surveys that go for a detailed look at relatively shallow structures. Explosives are needed to provide enough energy for the deepest surveys, some of which look at the full thickness of the crust. Would that be an application for ex-military explosives? Would the sharper and stronger pulse be of benefit? The soil is removed and stored, so that, after the coal is gone, the land can be restored – there are, in most countries now, strong regulations regarding reclamation, and a significant effort is made to achieve land recovery after mining. We don't have strong regulations about reclamation. One example is the concept of Approximate Original Contour required by regulation but never defined. Also, the Army Corp of Engineers has admitted in testimony that they've never restored land to original hydrology. Once all that earth is removed, it's impossible to get the compaction returned to what was formed by nature over millions of years. The downstream effects of radically changing headwaters are significant. Selenium poisoning. Increased flooding. The consequences are bad for humans. See, for example, ScienceMag: Mountaintop Mining Consequences. (B) On the question of energy usage in coal mining, I've noted with irony that one of the key markets for the proposed coal-to-liquid plants in Mingo County, West Virginia is coal mining operators. I haven't seen the details to know if it is for draglines and/or for coal transport equipment. To me, that's a strong argument against a CTL plant if that's the "best use" for the fuel. Heading Out - Did you ever encounter any discussions regarding the possible use of nuclear explosions to facilitate coal mining, similar to the failed attempts with so called shale oil. I recall once reading about such an experiment in Russia. Nuclear coal mining would really confuse the calculation of EROI. Appalachian coal mining drives me crazy. Casualty rates for underground mining are four times higher than for surface mining, underground extraction is extremely technically challenging for all the reasons Heading Out has mentioned in earlier posts, and as you say, surface mining in Appalachia involves major destruction of landscape and environment, on erosive slopes that ensure that toxic components of the rock will enter the ecosystem. In contrast, surface mining operations in the Western US are safe, don't permanently disrupt the landscape, and operate on flat land that minimizes runoff contamination. And here's the kicker: the majority of the U.S.'s coal production comes not from Appalachia, but from the West! Appalachian coal mining is the tail that wags the dog in the U.S. coal business. Every month, we hear about Appalachian mining companies killing their workers, destroying hillsides, and begging for government handouts. Meanwhile, every day Wyoming surface mines fill miles-long trains full of coal, so quietly, safely, and efficiently that most people don't realize Wyoming is even a coal-mining state. No matter where we get coal from, it's going to cause global warming. I'd love to find a way to stop burning it if we can. But if we're going to continue to use coal, can't we at least get it from places where its extraction doesn't kill people and permanently destroy some of the most beautiful land in America? On the other hand, you might say that if we as environmentalists and/or peakers want to stop or slow coal mining, maybe we *want* to have the Appalachian mining business around, so we can cast coal mining in the worst possible light. If we were trying to fight surface mining, we'd have to use statistics to convince people rather than photos of ravaged hillsides and teary-eyed daughters and wives. But if we do try to keep Appalachian coal around as a whipping boy, *we* become responsible for the deaths and damages it creates.